In 2011, the Dewees rec center was facing the possibility of closing due to lack of funding for renovations and ongoing programming. The Mid-Govans neighborhood and the York Road Partnership, Loyola banded together to fight to keep the rec center open. With community and university support of DeWees Recreation Center in the Maxwell House Drops of Good competition, the Rec Center remains open and earned a $5,000 grant for improvements. You can find more information about the grant in this Baltimore Sun article from 2012. Improvements to the Recreation Center were approved and completed by the city during the winter months of 2012. The center reopened in February of 2013 with fresh paint, facilities, and furniture. With the help and support of Loyola’s Office of Technology, computers and internet were donated and installed. Efforts are underway with community and public officials to develop strong, sustainable partnerships and increased programming for the Rec Center. During Rebuilding Day 2013, a yearly day of service through Rebuilding Together, volunteers completed repairs in 23 homes and completed over a dozen community beautification projects in the Mid-Govans and Colgate neighborhoods of Baltimore. 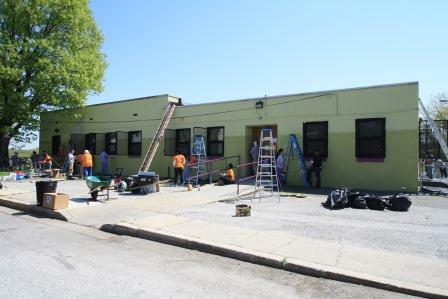 Their work included giving the rec center a much needed face lift outside. In the summer of 2013 a Maryland-DC Campus Compact VISTA joined the rec center to help build a Rec Council. William Baptist Jr. built up a recreation council. With the rec council and the Mid-Govans community, Will established programming at Dewees for young people in the area. Below are the results of a survey Will gave to community members to gauge what type of programming would be most interesting. Check out survey results here! Please send an email to friendsofdewees@gmail.com for more information about the rec council.